1) Using white cotton gloves to handle delicate or damaged prints, professional photo retouchers will digitize analog images using top-of-the-line scanners. It is essential to scan in high enough resolution to capture important details, such as clothing and accessories. 2) The digital file will often be converted to a monotone, homogeneous color palette to reduce the impact of fading, yellowing and other chromatic aberrations. 3) Once photos have been digitized, imperfections are identified by a team of retouchers. Imperfections may range from minor scuffs to severe water damage. Regardless of the damage, retouchers will painstakingly repair photos using Adobe Photoshop. 4) If it is deemed necessary by the retoucher or the client, careful color-correction will be performed. In many cases, determining a final color palette includes understanding the historical period during which the photo was captured. This step can require some research and consultation with the client. 5) The final version of the retouched and restored image is saved as a high-resolution digital file, which can easily be printed for display and framing. Digital copies are provided for maximum protection. 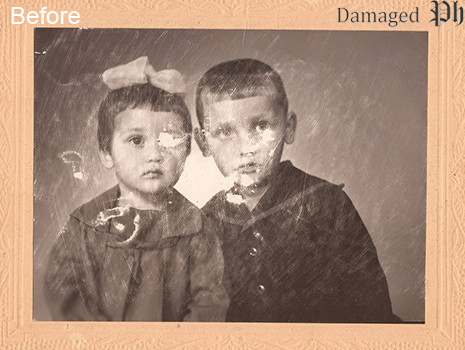 If you’re facing the task of restoring old family photos, consider the art of preservation. Ultimately, it is not simply photos you’re pressuring. You’re also preserving priceless memories. That’s why it’s essential to find the right partner to help you shoulder the responsibility of preserving memories. Our team has spent years working with families around the globe ad we enjoy collaborating with clients to repair their one-of-a-kind photos. If you’re curious to learn more, we would love to hear from you and see how we can help with your next photo project! About the Authors: The team at Damaged Photo Restoration are leaders in the picture-enhancing industry. Their skillset is equal parts art and science. With experts who are passionate about saving, preserving and restoring vintage photography, they seek out clients who want to protect family history for future generations. 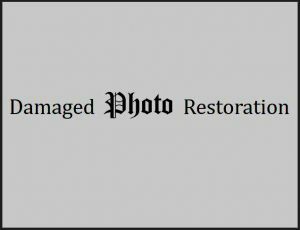 Whether it’s slight scratch removal, full colorization or custom repairs, Damaged Photo Restoration offers a myriad of services. With over a decade of experience working in the field of restoration, their team is seasoned and highly-trained. Thank you so much for this! Keep it up with the patiently explained tutorials about IMAGE RESTORATION and don’t get discouraged by no comments on your posts.